LONDON -- Britain's Court of Appeal ruled Monday against the parents of a terminally ill toddler who sought permission to take him to Italy for medical treatment that lower U.K. courts blocked in favor of suspending life support. 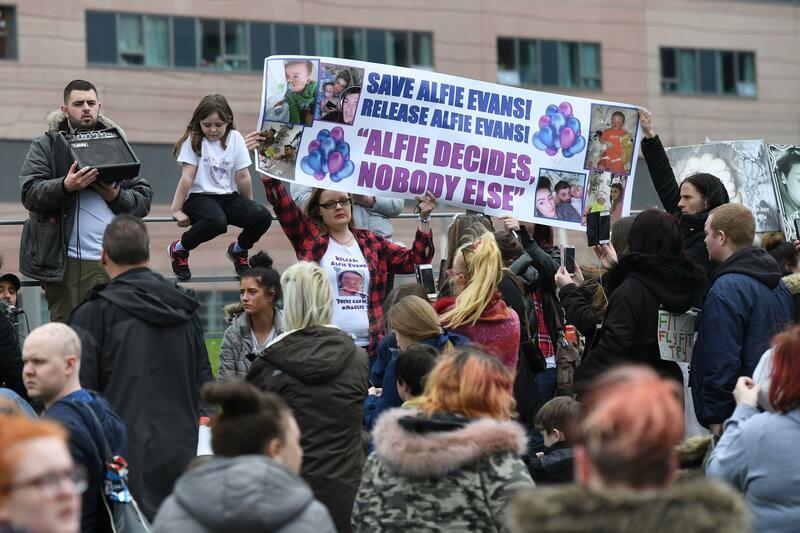 The parents of 23-month-old Alfie Evans have been engaged in a protracted legal fight with Alder Hey Children's Hospital over his care. They asked the Court of Appeal to overturn earlier rulings that blocked further medical treatment for their son. Instead, justices upheld a lower court's conclusion that flying Alfie to a hospital in Rome would be wrong and pointless. Some protesters gathered outside the hospital in Liverpool wept at the news of the appeals court's decision. Some chanted "Save Alfie Evans!" Alfie is in a "semi-vegetative state" as the result of a degenerative neurological condition that doctors have been unable to definitively identify. Lower courts have ordered the boy's life support to be withdrawn. Pope Francis prayed Sunday for Alfie and others who are suffering from serious infirmities. The pope's comments marked the second case in less than a year in which he expressed his views on the treatment of a terminally ill British child. Last July, Francis spoke out on behalf of Charlie Gard, who died from a rare genetic disease after his parents waged a court fight to obtain treatment for him outside of Britain. That included an effort to get their son an experimental treatment in New York. However, his doctors in the U.K. saw no hope of recovery. Under British law, it is common for courts to intervene when parents and doctors disagree on the treatment of a child. That applies to cases where parents have an alternative point of view, including from religious beliefs. In appealing the lower court rulings, Alfie's parents, Tom Evans, 21, and Kate James, 20, argued their son had shown improvement in recent weeks. But doctors said his brain was eroded and his condition was irreversible.